If you’ve never had a Primanti’s sandwich, do you even go to Pitt? Pitt Tonight is the university’s first – and only – late night comedy show, and they have been making waves in the short semester since they’ve arrived on campus. Whether you’ve sat through a taping, seen their short skits on Facebook, or purchased their shot pitcher at Hem’s, you’ve definitely seen their iconic golden circle logo somewhere on campus. Now, the group is vying for national attention by challenging a slightly more well-known late night show. In a video released earlier today, host Jesse Irwin challenges The Tonight Show host Jimmy Fallon to an eating contest. If Fallon can beat Irwin’s time at eating one of Primanti’s famous sandwiches, Irwin promises to bath in a bathtub full of fries and coleslaw – the two signature toppings for the sandwiches. If Fallon fails to beat Irwin’s time of 3 minutes and 57.18 seconds, he has to use one of Pitt Tonight’s mugs during an episode. To me, that sounds much better than bathing in coleslaw. Pitt Tonight takes many different elements from various other late-night comedy shows to create a successful show. Filmed live in the basement of The Cathedral of Learning, they have four episodes under their belt. 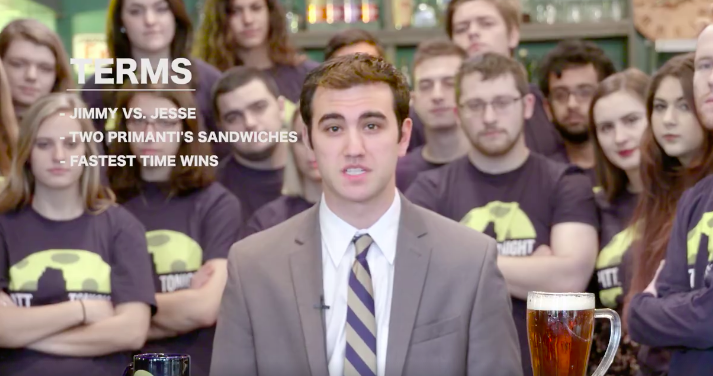 We reached out to Pitt Tonight for comment, and their Social Media Director Abby Stuebenbort explained how this all came to be: “Matt Knouff, the Primanti’s worker in the video is also a Pitt Student, on our Marketing team, a seasoned Primanti’s waiter/bartender, and also a Primanti’s finance intern. “He talked to Primanti’s one day at work and we got the OK and that they would partner with us! We weren’t exactly what else we needed for the campaign… Sure, we had the sandwich eating part down, but that’s about it. We were throwing around all kinds of ideas like mini-challenges while eating and other crazy stuff until one of our writers, Isaac, was standing by our meeting and suggested if Jesse wins, Fallon has to use the mug. Are you #TeamFallon or #TeamIrwin? The kit even comes with a free t-shirt. The famous Primanti’s sandwich, topped with fries and coleslaw. The video has quickly began it’s journey to going viral, reaching 8,000 views under 3 hours. It was also talked about on 96.1 KISS FM, and has been tweeted about by a variety of Pitt-Based accounts. Fallon has yet to respond to the challenge, but fans are already showing their support with #FallonVSIrwin Tweets. We are definitely on #TeamIrwin, and can’t wait to see what, if anything, Fallon’s response will be.